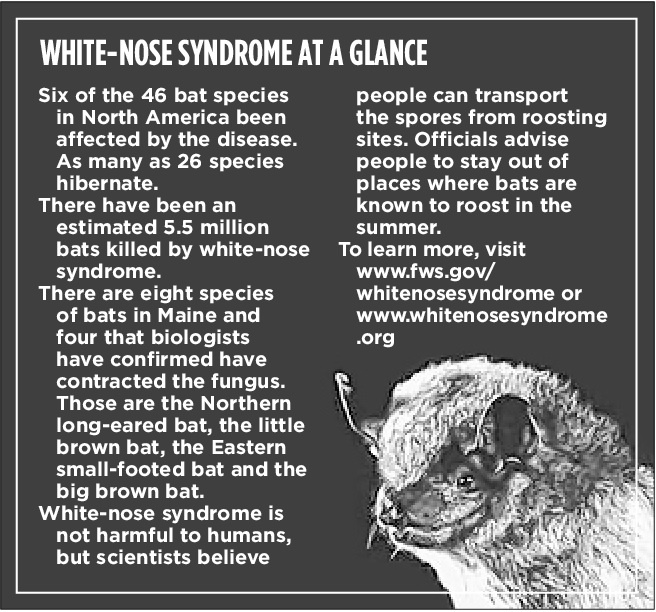 This summer in Maine and across the Northeast, an all-out effort will begin to survey and try to protect bat populations that were decimated by white-nose bat syndrome this winter. Maine biologists confirmed in March that the disease now has a foothold here, just as it has throughout the Northeast. And after the disease was found in several more states, federal biologists have little optimism for the future of half of North America's bat species. "It's not likely we'll see in the Northeast in our lifetime, or our great-grandchildren's lifetime, bat populations at pre-white-nose syndrome levels. We do have sites where there is up to 100 percent mortality. It's disheartening," said Ann Froschauer, spokeswoman for the U.S. Fish and Wildlife Service in Hadley, Mass. Because so little is known about bats, scientists can't predict the possible impact of the disease, but seeing more insects where bats previously had thrived is one possible result. The disease that was first documented in bats in New York in 2007 was found this winter in states as far south as Alabama and as far west as Missouri. It is now confirmed in 19 states and four Canadian provinces, and is estimated by the service to have killed 5.5 million bats in North America. Of the 46 bat species in North America, six are confirmed to have the disease. But with as many as 26 species of bats that hibernate in colonies in caves and mines, the threat of more species contracting the fungus exists. "Half the species in North America are at risk," Froschauer said. In Maine this winter, biologists found the first signs the fungus is spreading through the state's bat population. At two of three hibernacula -- the caves where bats hibernate -- state biologists found fewer than five bats, compared to the 70 to 80 that occupied the sites in past winters, said John DePue, Maine's small mammal leader. "We were kind of expecting low numbers, but maybe not quite that low," DePue said. And in Acadia National Park, where bats were not known to hibernate, dead bats with the white fungus were found this winter for the first time, Froschauer said. "I don't think we were surprised. The disease has spread rapidly through the Northeast and in Canada. As a result, we're finding bats in places we didn't know they were," Froschauer said. State biologists with the Maine Department of Inland Fisheries and Wildlife visited the two known hibernacula sites here March 8 and 16. A third site is documented and was visited, but was not entered because it is believed to be clean of the fungus, and DePue said biologists did not want to spread the disease. No dead bats were found outside the third cave. "That's the glimmer of hope," DePue said. Still, the rate at which the fungus has been killing bats across North America puts the survival of some bat species -- notably the endangered Indiana and gray bats -- in question, Froschauer said. Moreover, there is little known about bats to help guide biologists, Froschauer said. "We're playing catch-up, so we can better understand their natural history. We don't yet know the future because what we have been seeing has happened on such a compressed time scale. We don't really know why some bats are living and some are not," Froschauer said. How fewer bats will affect the ecosystem and natural resource industries, such as agriculture, also is an unknown, said Jim Dill, the pest management specialist with the University of Maine Cooperative Extension. Bats feed on insects, but how much of a dent Maine's bat population has made in decreasing insects on the landscape remains to be seen, Dill said. Since bats feed at night, they feed on insects that are out at night, such as moths. But the insect pests found on agricultural crops are often feeding during the day. So bats' role in pest control is a mystery, Dill said. "We don't know the natural history of bats, and how many agricultural pests they are really eating. We've been tossing that question around. Certainly, they eat a lot of insects. But we don't know if the bat population has made an impact. Our gut thoughts are, probably it won't make a huge difference. But it's a big unknown," Dill said. To help find answers quickly, federal research grants totaling $9 million have been given out since 2007, and a total of $12 million has gone to help states manage the disease. No federal money yet has gone to Maine, because its winter bat population is so small. But efforts will begin here and across the Northeast to survey summer bat populations. Starting in June, volunteers will be asked to watch known bat roosting sites and take note of the bats that come out to feed at dusk. State biologists then will get an estimate of what bats are here and the condition of those bats. It's a surveillance project biologists hope will teach them more about white-nose syndrome, but an added result will be they will get basic information about bat populations everywhere. Right now, IF&W is working with Maine Audubon to recruit volunteers across the state to help with the summertime "emergence counts." Maine is believed to have a relatively small winter bat population compared to New Hampshire, New York and states to the south, but could prove to have a robust summer population, DePue said. "Maine has a lot of water and a lot of insects. Like with migrating birds, bats come here in the summer. They've come here for thousands of years. It's a great resource for bats," DePue said. "We know there are thousands of bats here in the summer, but how many show up? We don't know." For now, biologists are hoping Maine proves to be a haven in the summer for bats that have escaped the disease. 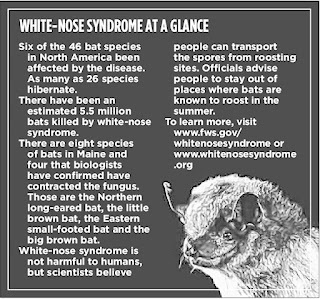 However, Froschauer said even if white-nose syndrome stopped spreading now, it would take hundreds of years to get bat populations back to the levels they were at before the fungus started spreading five years ago. "We're just starting to think about what this means in the Northeast," she said.